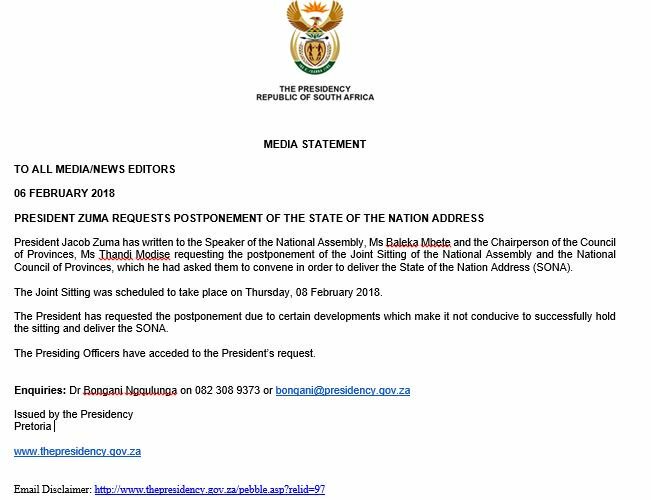 To further heighten public interest in what is going on around a possible departure from office by President Jacob Zuma, Parliament on Tuesday announced that the 2018 State of the Nation Address (SONA), which was scheduled for this Thursday has been postponed. Last week, Parliament had said that arrangements were at an advanced stage for Zuma's SONA. Without devulging much, the Speaker of the National Assembly, Baleka Mbete, said the Parliament's presiding officers had, however, been approached by Zuma with a request to postpone the speech to allow room for the creation of a more conducive environment in Parliament. This in light of media statements by several parties that they would not allow President Zuma to deliver his 2018 SONA - with some calling it a waste of taxpayers' monies given the uncertainty surrounding the future of Zuma as President. The African National Congress (ANC) National Executive Committee (NEC), led by Deputy President Cyril Ramaphosa, is scheduled to meet on Wednesday to decide Zuma's fate - on what was going to be the eve of the SONA. “We met the President today and he was already writing to us asking to postpone. We want a conducive political environment… We have been dismayed at anarchy of the past four years. Developments this year have caused us great concern…” Mbete said. Mbethe, however, said that the National Budget speech by Finance Minister Malusi Gigaba was still on at the end of the month. She said that the decision was taken in the best interest of parliament and the country. A new date for SONA will be announced in a week's time.